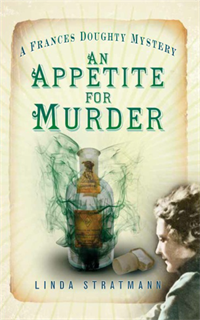 An Appetite For Murder is the fourth book in the Frances Doughty Mysteries featuring a Victorian lady detective, and explores the worlds of dieting, health food and vegetarianism. Frances finds that two apparently innocuous cases are not only connected, but involve several murders. How do you carve out time to write? What's your writing routine? I am a pensioner so don’t have to meet the requirements of either a day job or a young family. Writing is effectively my full-time job. I love it and spend all my available time on it. (I am writing this at 8 am on a Sunday morning) One day I will scare myself by adding up my weekly hours! It could be any of the three. A book idea starts as a concept like a tiny crystal, which just grows in my mind. An Appetite for Murder started from two separate ideas I wanted to include and then weave together. How did Frances Doughty come into being and does she have an historical counterpart? It annoys me that so many fictional heroines are described as beautiful and a lot of the plot revolves about them being able to get their own way by fluttering their eyelashes at a man. I decided from the outset that I wanted my heroine to be a woman who gets what she wants with brains and determination. She is young because I want her to learn and develop over the years. Sarah her trusty sidekick is essential not only as a support for Frances also to ground her. Lady detectives do appear in fiction from the 1860s and the concept of the female detective is sometimes referred to in the Victorian press. I wouldn’t be surprised if detective agencies employed women in roles for which they were thought especially suitable. Ruth Rendell and PD James are my great heroines of crime writing and Agatha Christie’s ability to misdirect the reader is second to none. I read very widely; I always have several books on the go at once, both fiction and non-fiction. When I read for relaxation I go for something that is a complete contrast to what I write myself, usually in a contemporary setting. Waterstones in Walthamstow is a big friendly store, and wonderfully supportive to local authors. The staff go to considerable trouble to ensure that writers’ events are well organised. Two books at once! I am writing the fifth Frances Doughty Mystery entitled The Children of Silence, which concerns the Victorian attitude to people with hearing disabilities. I am also engaged on a history of nineteenth century poison murder. Next year will see the start of a new detective series set in Brighton, and we will be in the world of Victorian spirit mediums. Very interesting, thanks to both of you. I have read the first 2 books in the series, and now must catch up! Thanks, Moira, good to know this. This series sounds right up my street. Thank you for bringing it to my attention, Christine. Saw Linda on the BBC2 prog on Shop Girls this week. Excellent programme, too.